Jordan – Petra, Little Petra, Wadi Araba, Wadi Rum. Day five. After an exhausting but rewarding long day in Petra yesterday Dad and I were both in agreement that we would have a little lie in and just ‘pop’ into Petra for a few hours in the morning before Omran picks us up. Little did we anticipate that there was possibly the most inconsiderate noisy tour group staying on the same floor as us and we were woken by them at 5am. Reminds me of my hosteling days with people arriving and leaving the room at all hours of the night. You learn to catch some sleep as and when you can, but it’s not ideal, especially the older I get, and especially when you stay in hotels. So we decided to just get up, breakfast, pack and wander down to the visitors centre for a not too shabby start at 8am. It was weird walking down to the Siq passing three tour groups with at least 50 people in each group. Just before we arrived at The Treasury there was so much noise echoing against all the cliff faces mainly the sound of horses galloping across the concrete floors pulling what seemed like very un-sturdy carriages. So different from the peace and tranquillity of the morning before. This morning’s visit was to wander through the main parts again, explore the Royal Tombs which had a little bit of a climb up too, and to try and tear Dad away from the sight of The Treasury, bless. Omran picked us up at 12pm, so we didn’t have to check out before heading back into Petra which helped greatly as our next big destination was the desert and I could sort out my warmer clothes before leaving. A few kilometres from Wadi Musa is ‘Little Petra’, personally I think it should be renamed ‘Tiny Petra’. It takes about half hour to have a little look round and we only saw a trio of guys and one other person. It might take you longer to look round if you believe the sign pointing up between two cliff faces stating “The Best View in the World”. I climbed half way, Dad being a lot more adventurous (and steady on his feet) reached the top when a guy started coming back down saying it’s not a particularly great view, he was followed by a local woman shouting for us to stop for tea. We didn’t. 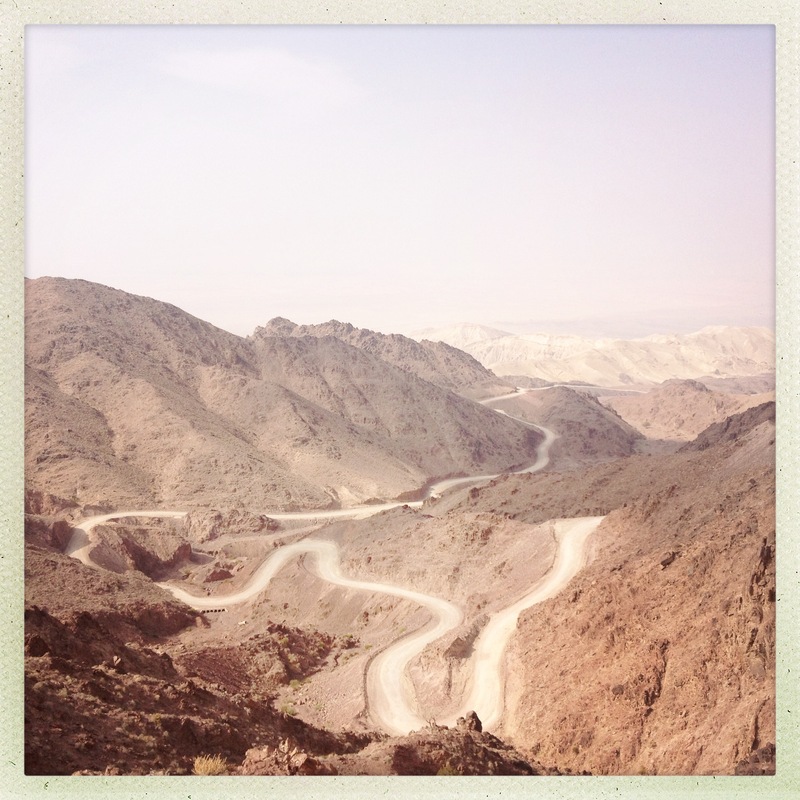 To get back onto the road to Wadi Rum we had to drive back the way we came and back through a Bedouin settlement. The settlement was built by the government for the local Bedouins, to encourage them to move out of the Petra complex and provide them with housing, health services and education for the kids and all for free. Some Bedouins still choose the nomadic life but this answered our question about whether the kids running around Petra trying to sell you items had access to schools. We stopped for lunch at a very local restaurant where Omran knew the owner. You can’t beat falafel for breakfast, lunch and dinner!!! If you follow the windy stony road it will lead you to the Israeli border. I received a ‘Welcome to Israel’ message from my phone provider. If only *sigh*. I will go back one day! 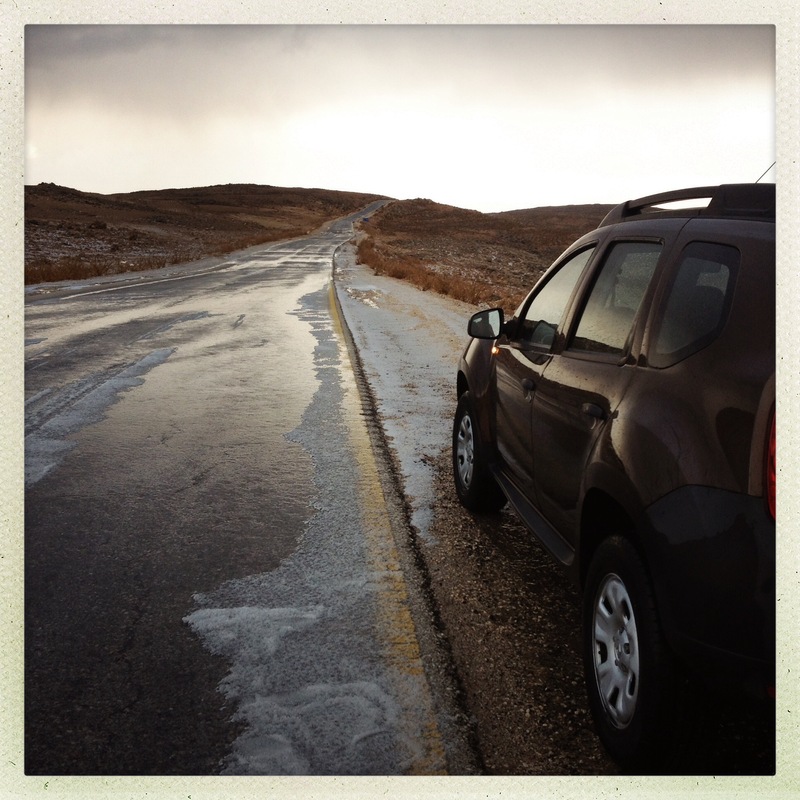 Back on the road and suddenly we found ourselves crossing the desert plains after a massive hailstorm. It looked like it had snowed! In the desert! 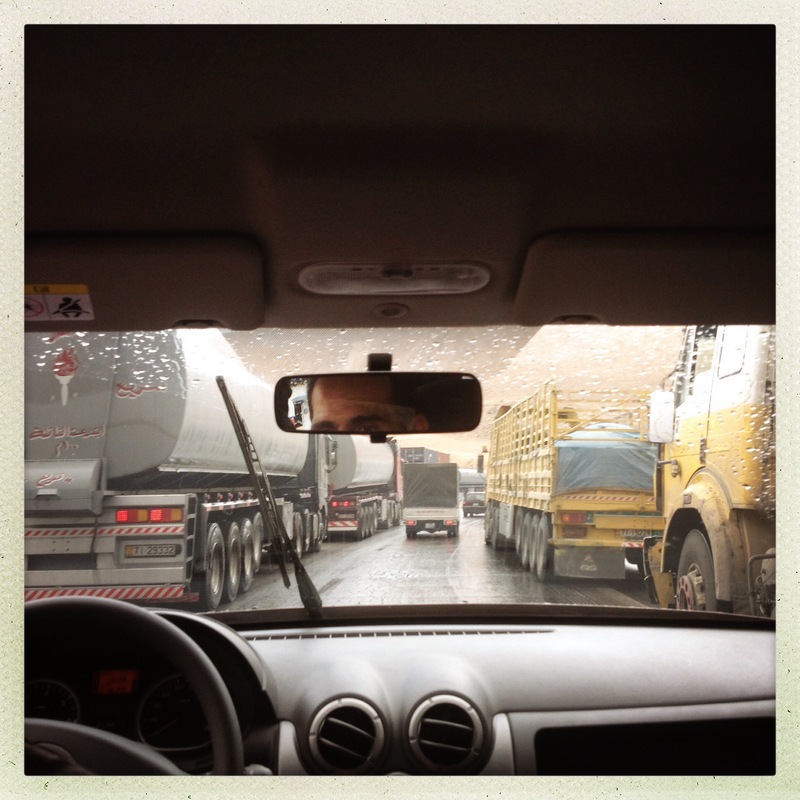 Back on the highway and little did we realise how much the wet weather would affect all the lorries on the road. There are weighing stations placed along the highway. Most of the lorries are carrying very heavy loads, so you see some of them parked up about a km away from the weighing stations, waiting till they close so they can continue their journey without being stopped. Majority of the lorries also have what we call in the UK ‘bald tyres’. Absolutely no grip. Combine the heavy loads, bald tyres and a hill road which is wet = lorries slowly sliding into the central reservation to use the barrier to stop them. There were dozens of lorries stuck going up and down the hill. Those trying to drive up the hill, all you could see was their tyres turning but the lorry itself was still sliding back down the hill. Omran skilfully managed to squeeze in between some lorries to drive us through to a gap and onwards to safety. Wadi Rum is the largest wadi in Jordan at 280 sq miles. It’s the most popular place in Jordan for tourists to experience an evening sleeping either under the stars (weather permitting) or in a traditional Bedouin tent. A simple meal is put on in the evening and there tends to be some sort of evenings entertainment depending on which camp you’re staying at. 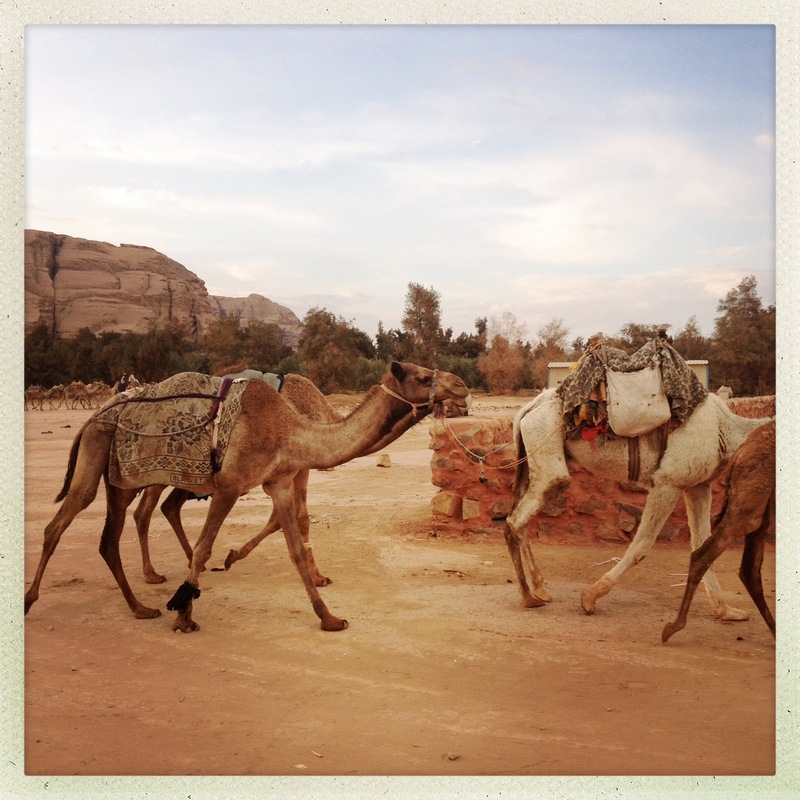 Camel treks or a 4WD tour can be arranged the afternoon before or morning after. Arriving just before sunset we stayed at a camp that was arranged by our driver Omran. Myself, Dad and Omran were the only people at this camp and you could only see desert and rock formations for miles around. There were basic Bedouin tents with sturdy camp beds and plenty of warm blankets provided. A proper toilet block (no digging in the sand! ), a kitchen and a simple ‘lounge’ type room where the fire was lit and traditional tea and coffee served to us along with our evenings dinner. The lamp in the lounge was generated by the 4WD so remembering our head torches was a god send for our sleeping tents. After the meal we chatted for a while. Our hosts didn’t seem to speak very much English which made it a little difficult to communicate but a pleasant night was had and Dad and I retired early. To be honest it wasn’t the best nights sleep I’ve ever had. There were two playful kittens running around the camp in the evening which between them and my Dad scared the **** out of me at about 1am. Haha. They were running across the tops of the tents and Dad shouted out to “shoo them away”, I thought we were under attack or something haha. There seemed to be so much traffic driving through the desert too! I’m guessing as the land is so vast that in the dead of night you can hear a vehicle coming from miles around, plus our host had trouble re-starting his 4WD to take him back to his home in the village. I also slept in all of my clothes and extra thermals I brought along especially for the ‘desert’ experience. I highly recommend that if you plan to stay in the desert in the autumn, winter, spring to bring warmer clothing – it does get surprisingly cold at night! 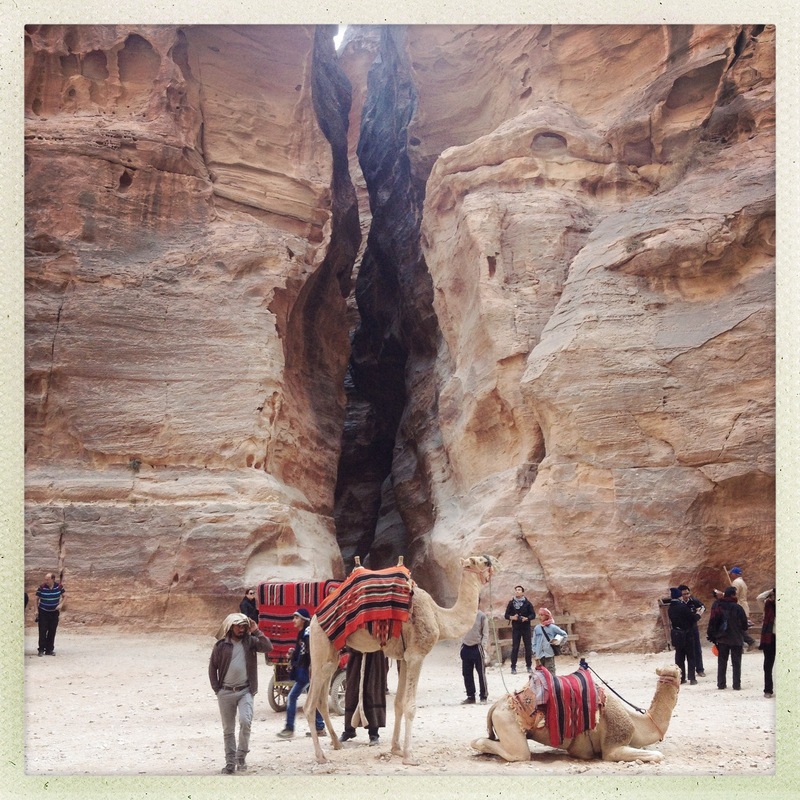 ← Jordan – Petra. Day four.